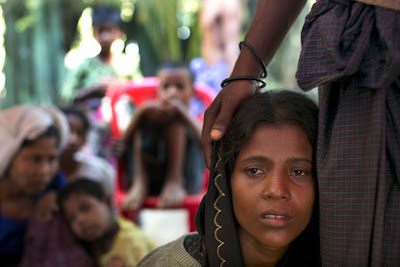 Almost a year ago the pogroms of the Rohingya in the Arakan began in earnest. After months of Nazi style propaganda being pumped into the region the murmur of hatred erupted into violence. We were told that the "ethnic violence" went both ways. We were told that the Rohingya started the ethnic clashes and therefore could not be considered the victims. This all came from countries that had just previously lifted their sanctions upon Myanmar and were suddenly interested in doing business with the second most reclusive country on the planet. Of course, with Burma opening up the country did jump up in the rankings leaving North Korea alone once again. Yet with all the talk about how horrible (code in the West for inconvenient) the slaughtering of Rohingya men, women, and children; the supposedly civilized world did nothing to stop the bloodshed. European leaders welcomed Suu Kyi and Thein Sein to endless events and even awarded the two architects of death with the Nobel Peace Prize. When Thein Sein's military establishes concentration camps and converts Rohingya neighborhoods into ghettos... automatically nominated for a Peace Prize. When Suu Kyi tells the West that the Rohingya "question" can only be answered by Burma and that her country will decided who gets citizenship or not... pat on the back and oh yeah, Peace Prize. Then there is Obama. The great supporter of democracy. The anointed leader of a failed agenda to get the world to love America once again. And yet all he can afford the Rohingya is a short speech and some hollow promises about America's support for equality and justice. But to be fair, this was another Nobel Peace Prize winner who did nothing to earn it. So it only makes sense that Obama, like Suu Kyi, shouldn't have to denounce the murderers and admit that Myanmar is committing genocide. Time and time again Alder's Ledge has recorded events from the Arakan without much help from our usual supporters. 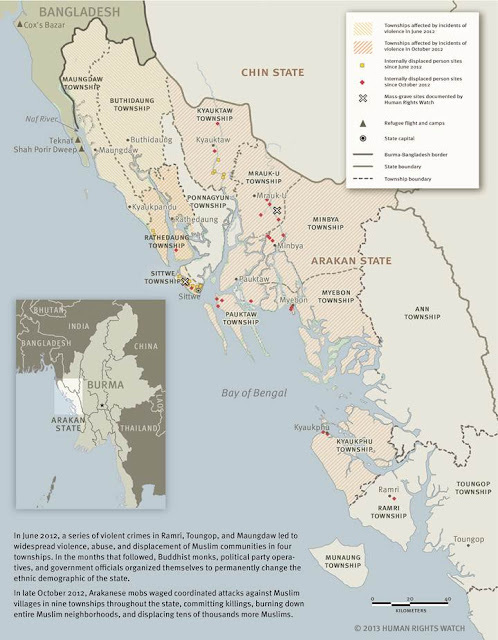 We have reported on the attempts by the Burmese government to force Rohingya out of Burma by driving them into the sea or over the border and into Bangladesh. This was then followed by reports of Burmese officials helping Buddhists "Burmese" to immigrate from Bangladesh and take over the suddenly unoccupied Rohingya neighborhoods and villages. Yet with the striking similarities to past and other present cases of ethnic cleansing the world remains silent. For the past year Alder's Ledge has made it a top priority to highlight the plight of the Rohingya people. Now we are asking our old followers and our new ones to join with us and help spread the news about the Rohingya genocide. This is a simple act that helps break the silence surrounding the genocide and raises awareness of it. We here at Alder's Ledge call it "screaming". All you have to do to take part is to share these articles here and the reports we share such as this one by Human Rights Watch. By posting the links on your Facebook, Twitter, Pinterest, or even Instagram you allow these articles a wider audience than they would otherwise receive. Reports like this one from Human Rights Watch are only usually given blips in news reports and short articles by media around the web. Your sharing them allows this important topic to be seen by people who might never hear about it otherwise. Help Alder's Ledge bring some form of recognition to the plight of Rohingya people. Let us not fall into the mindset illustrated by Joseph Stalin. May we never believe for even a moment that the death of one person is somehow more of a tragedy than the deaths of thousand of innocent people.